Lycra has become a byword in the modern fashion landscape. 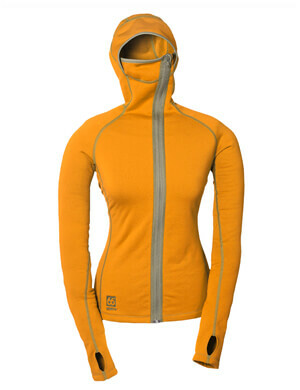 Today, this synthetic fibre is also found in many outdoor clothing products. Strictly speaking lycra is not a fabric; it is actually a fabric component that can be combined with synthetic fibres and natural fibres. The addition of a small portion - 2% can be plenty - is enough to change the properties of the end product. The synthetic elastane fibre is highly elastic and has outstanding elasticity. It can be stretched up to 700% under tension, before returning to its original length when released. Clothing containing lycra is also wrinkle-free and low-maintenance - ideal for everyday wear and travelling. Outdoor trousers in the mountains, swim briefs for the quarry pond or close fitting running tights for trail running - pretty much all clothing contains at least a small proportion of lycra. This ensures a tight fit and allows for excellent freedom of movement! Lycra was originally developed for use as elastic in women's underwear. Then it wore out over time and foundation garments lost their perfect fit. This synthetic elastane fibre quickly became popular in swimwear. Swimsuits and swim briefs became lighter, more quick-drying and held their shape in water. Then came the aerodynamic cycling trousers, cycling jerseys and ski suits. The stylishly designed models of Vaude, Maloja and Qloom are highly functional and not just an insider secret! In the 1970s the fibre found increasingly popularity in clothing. It was disco fever! Flamboyant, brightly coloured leggings, figure-hugging jeans and leotards were all the rage. And anyone involved in climbing and bouldering has seen the legendary images of Wolfgang Güllich, Jerry Moffatt, Isabelle Pattissier and co. Tough manoeuvres, wild moves - of course with that authentically stylish leg wear! The first models featuring compression for running and cycling clothes came on the market in the 1990s. The compression contributes to the prevention of muscle fatigue and promotes recovery. The range of lycra products is constantly developing. Xtra Life is very chlorine resistant and shape-retaining. Swimwear manufacturers can use it to create different styles and longer-lasting products. Jumpers and outdoor clothing are less restrictive and keep their shape longer.